Our partners ‘Fursa kwa Watoto’ (opportunities for children) have been busy getting parents involved in the pre-primary schools of Tanzania. Mums and Dads have been encouraged to come along to meetings to learn how they can help prepare their children for school and also how they can help by providing songs and games they learnt as children, or help collect items that can be used in the classroom to promote learning. 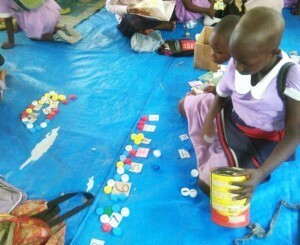 For example, to the right you can see that discarded plastic bottle tops make great counting aids and markers in games. The initiative realises that parents have good ideas and know the children best, and that together the teachers and parents can create a great environment for children to learn. Parents are made to feel special, needed and appreciated. As most families face financial constraints they are not asked for money, but simply their time or skill in helping to make a game. The parents have enjoyed being really involved in their children’s education. They have loved being able to offer a helping hand, and have had fun passing on some of the songs and games from their own childhood.